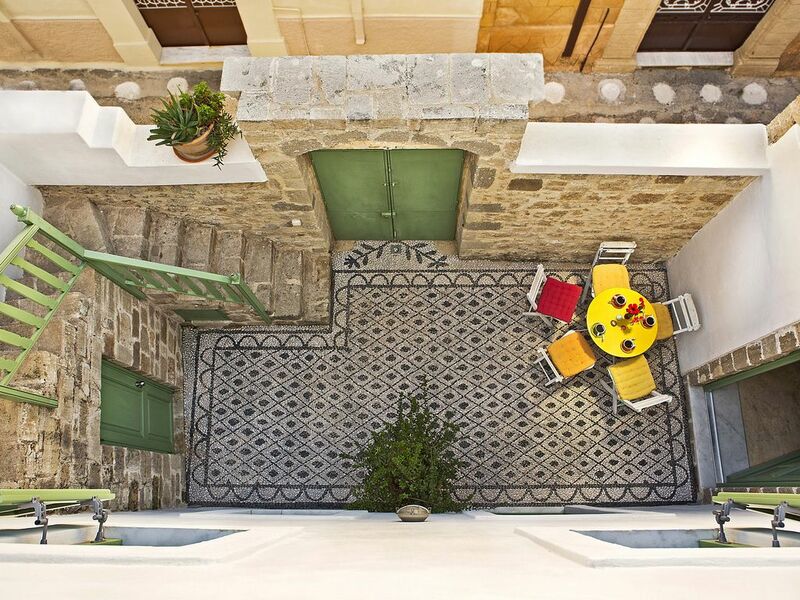 The Myrtia House is a beautiful stone built old village house of late 1800 with 2 air-conditioned bedrooms, 2 bathrooms, a living room with a double sofa bed and a separate kitchen, a wonderful romantic courtyard with mosaic pebble floor, and three terraces on different levels. The house is intimate enough for just a couple yet large enough for a family of 6 persons. The house is located in a typically Greek lively neighborhood. The Myrtia house is a very tastefully and colorfully designed rental house, all furniture are old and we had them restored. Which is something that has resulted in the most cozy holiday home and worthy of spending your precious vacations. There are lots of candles everywhere, and the lightning is always dimmed, indirect and warm: something that is very important for us and most of our artistic lamps and mirrors are made by our good friend Inez Lacunes, who lives and works in Lahania where she sells her art. In the myrtia house you can have a real holiday like any vacation should be: enjoy your breakfast in the morning sun on the wonderful terrace or relax on one of our sun loungers. There is sea view from 2 terraces. You can sunbathe totally private (naked if you like) sleep on the roof terrace in the lovely double hanging bed. The Myrtia house is a very colorful and happy rental house that is only for rent since may 2010. It was a ruin that we renovated during 2 years into the beautiful holiday home that it has become now. The house has 3 different roof terraces, with a built in bbq, 2 dining areas, a double hanging bed under a pergola, and on another roof terrace one can lie in the sun on the sun beds for hours so that one really has a feeling of making the most out of the holiday. You enter Myrtia house via a charming enclosed courtyard. Walk inside the holiday home to the lounge dining area with a double sofa bed or to the well equipped kitchen and adjoining a beautiful bathroom. Next to the bathroom is the downstairs bedroom, which has mosquito nets over the beds, and cozy lighting. Going upstairs you will find the nice wooden double bed, and an en suite bathroom, which are all very colorful. From the bedroom you can go onto the terrace with the kitchenette and b.b.q. which is also reachable through the outside stairs. One terrace further up, one can enjoy on the sun beds and enjoy full privacy because of the walls around. One terrace further is the hanging bed for 2 people with mosquito nets, so one could even sleep there. From this terrace you have a sea view and you can see Turkey and Marmaris. Ground floor patio: with dining table and a sitting couch. 2nd level a built in bbq. and sink like an outside kitchen, with some chairs and a table. There is reach ability to the terrace from the top bedroom as well as from the outside stairs. 3rd level: double size sun bed behind walls, total privacy, for naked sunbathing if wished. Views on the sea and on an olive grove. 4th level, roof terrace where one can sleep and relax on the hanging bed with a pergola on top for full protection. Its ground level is used as living room and dining room, but there is also a dining area outside at the courtyard. Its upper level consists of two pataras (= wooden traditional Koskinou platform bed), which are set at different levels and are accessed by individual staircases. Each one of them sleeps two persons. There is one well sized bathroom with basin, shower and toilet, and to be comfortable, another small toilet with shower and basin was built. The kitchen is fully equipped, and is spacious with a dining area. All the kitchen furniture is made of old wood and there is a beautiful closet, that was handmade a long time ago. The kitchen door opens onto the courtyard. On the other side one gets into the hallway with the main bathroom and a bedroom. The kitchen is also the place where one goes up the stairs to the bedroom upstairs. There are 2 bedrooms that both have airco and a bathroom next to it. They both contain double beds, and sufficient space in the closets to tuck away ones clothes. If desirable, in both rooms, a baby cot can be placed. Hi, I am Nik Mihail Stavridis and I am directing SimplyGreek Villas Houses with wooden ceilings, stone arches, white walls with rounded off corners and blue wooden windows and doors will give you the feeling you are actually in Greece and not somewhere else. I love simplicity, Art, Friendship, Nature, Interior design, Organic Farming and gardening, Eco-Friendly building, Renovating Old Furniture and I am recycling... I play tennis and horse riding so any of my guests are welcome to join me. Hospitality to me is of the utmost importance. I grew up with it and so for me just renting out a house is not enough. I do everything in my power to provide my customers with anything they might expect and more, and to offer them a special, organized and clean home with atmosphere and character that will give them the opportunity to unwind,explore, relax and enjoy a great holiday. I am looking forward to welcome you in my home ! The village of Koskinou is an old one, although from the very first houses is not much to be seen left. There are some ancient monasteries that one can visit. And in the old village of Koskinou is a museum where you can find the means and ways of how one was living here for the past 300 years. Well worth a visit if you are attracted to the old Greek houses and the authentic lifestyle of people. Myrtia House is extremely comfortable and very well-equipped. Its location in the middle of Koskinou is a bit difficult for car park, but once inside it's well worth it. Lots of space, kitchen amenities excellent, bedrooms very comfortable and closets galore. The neighbors are a delight and very helpful, like Nikos himself, and the village is full of surprises. I recommend this location fully. Niko war stets freundlich, hilfsbereit und stand immer zur Seite bei Fragen, Tipps und Unterstützung für einen tollen Urlaub. Vielen Dank an dieser Stelle an Niko! Das Haus war tipptopp wir bekamen Essen, Trinken bei der Ankunft und viele wertvolle Tipps. Alles hat gut funktioniert und auch die Umgebung (Nachbarn) waren super nett und sehr herzlich. We have past a very, very nice week with our children. Myrtia House is very beautiful, colored and confortable. Old charming house, clean, with all facilities and an excellent Customer services (very helpfull) !!! Located in a typich small quiet village, , no far of Rhodes City, we have enjoyed of this beautful island, his interesting monuments and nice beach. If you like charming house, we recommend you Myrtia house !!! Thank you very much for writing your lovely review on Homeaway. I am very glad that you like the traditional character of Myrtia house but you had also found it comfortable. Une maison accueillante et pleine de charme dans une rue calme et sans autre touriste que nous. C'est authentique, joliment et confortablement rénové. Koskinou sur sa partie perchée est un village typique avec d'anciennes maisons, des rue étroites parfois ombragées, on trouve sur place plusieurs restaurants et, en bord de mer, il faut découvrir la plage "Terme de Kalithéa" (10mn voiture). 3€/jour pour accès de 8h00 à minuit à cet ensemble offrant les meilleurs services d'une plage privée et la beauté d'un lieu, le luxe à la portée de tous. Bonnes vacances, et encore merci à Nikos et Nikole pour leur charmant accueil et les fleurs dans la maison. Merci beaucoup pour votre bonne critique! Vos paroles sont précieuses pour nous. Je vous prie d'accepter l'expression de nos salutations distinguées! Although early in the year and many shops and restaurant in Rhodos were still closed we enjoyed our week in Koskinou very much. Myrtia House is a lovely restaurated little place right in the middle of a small street, far away from the great tourist hotels. Well equipped and coulorfully desiged you easily feel at home. You need, however, a car. But if you have one your are for instance in the old town of Rhodos within 15 Minutes and may take Koskinou as a good starting point for all other tours around Rhodos island. Nikos was a ice manager and provided us with all necesarry information. I would like to recommend this property to all those who like it a littel bit quieter off the tourist masses. I am honoured for your stay and that you have taken the time to leave your review of our property. I am delighted to hear that you were satisfied with your stay. War sehr gut. Haus war sehr schön und der Gastgeber war wirklich maximal freundlich. Gerne wieder. Koskinou is located just 6km from Rhodes town. It lies on top of a hillside and is one of the most important traditional villages on the island with dozens of beautiful homes which have maintained to this day their unique characteristics; The center of the village is a maze of narrow streets whilst from many other points, the views of the sea and the coast of Asia Minor, are impressive. Just 2km away are Kalithea Thermal Springs and the blue flag beaches of Faliraki. The village is well known locally for its traditional sweet melekouni. Melekouni is honey and sesame bars which are made for traditional celebrations such as weddings and baptisms and handed out to all the guests after the celebration. They symbolize a sweet life and are very particular to Rhodes. The region has experienced vigorous residential development in the last twenty years, primarily from Rhodians, because of its close proximity to the city. A notable development was the purchase of traditional village properties, a significant number of which have been renovated.